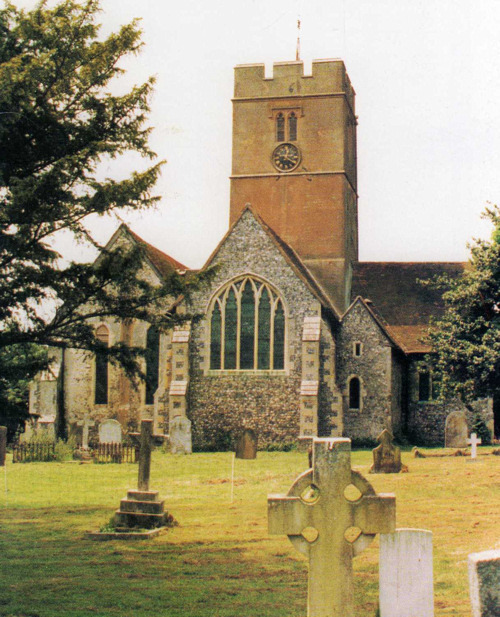 The church is situated in Selling, about four miles south-east of Faversham. St Mary's church stands in a countryside setting on a high point in the village overlooking the Swale and the north Kent marshes. It has a fine bell tower affording excellent views over the surrounding area. To view the stained-glass windows of St Mary's, visit our Stained Glass window page. The parish is one of four making up The Downsfoot Cluster. There are five active churches in the benefice, in Selling, Sheldwich, Throwley, Badlesmere and Leaveland, all adjoining parishes. The benefice is part of the Ospringe Deanery in the Diocese of Canterbury. The earliest mention of a church on this site is in 1054, when it was granted to the Benedictine abbey known as St Augustine's Canterbury. The Domesday Book mentions the building, and the grand survey of 1086 indicated a church on the same alignment as now with a chancel, a nave and a tower. However, by 1190 a larger structure had replaced the original and parts of this building, namely the west wall, the tower and the chancel, are still standing. The nave was rebuilt around 1300 and decorative battlements and windows added around 1450. The monks of St Augustine's, during their 493 years of ownership were responsible for almost every architectural feature that we see today, including the graceful pillars and the fine arcaded chancel. The present church is cruciform in plan comprising nave, central tower, two transepts three chancels and north and south aisles. In the late 15th century the tower was raised one storey and given additional support with arches in the Perpendicular style. There was little alteration then until the middle of the 19th century, except for removal of the stone altar, a rood loft and chancel screens and the erection around 1700 of a singers gallery at the west end of the church. In the 1840s and 1850s various improvements and adaptations were carried out and an organ placed in the west gallery (see music at Selling) - moved to its present position in the south transept by 1850. In 1852 the west porch was rebuilt and a south porch added. The west gallery too was removed and replaced by an elaborate mural monument under a Gothic canopy.